(TibetanReview.net, Jul29, 2014) –Chinese soldiers had intruded into the Demchok area of Ladakh on Jul 22 in India’s Jammu and Kashmir (J&K) state and pulled down tents put up by Indian herdsmen while at another location in the same area around the same time herdsmen from across the border had put up tents, said Indian media reports Jul 28. The herdsmen from the Tibetan side of the border moved back a day later, following a flag meeting between the commanders from the two sides, reported freepressjournal.in Jul 28. While the first incident was based on a complaint by an Indian herdsman to political representatives of Ladakh in J&K saying he had discovered that the tents he had pitched a day earlier had been vandalized, apparently by Chinese soldiers, the second incident was discovered by Indian soldiers. IBNLive.com Jul 28 cited Bharatiya Janata Party MP Mr Thupstan Chhewang, who belongs to Ladakh, as saying the Chinese Army had destroyed Indian nomads’ tents in the area and had tried to erect their tents. An Indian patrolling team was dispatched to the spot and later a Chinese People’s Liberation Army team also reached there, said the freepressjournal.in report. Asianage.com Jul 28 cited Defence sources as saying such incidents occur often at Demchok since it was one area in the Ladakh sector where both Indian and Chinese troops were extremely vigilant and sensitive about any structures being raised by the other side. 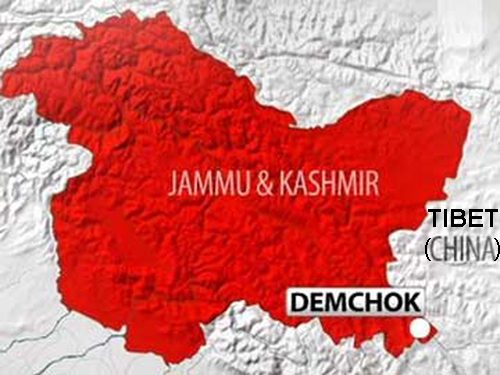 It added that Demchok was, in fact, identified as one of the locations along the Line of Actual Control (LAC) in the Ladakh sector as emergency meeting points for representatives of both the Armies to meet to ensure maintenance of peace and tranquility along the LAC. Thupstan Chhewang has called the two incidents “a very serious issue” while Nationalist Congress Party leader Mr Tariq Anwar has asked India to lodge a protest with the Chinese by summoning their envoy. Incidents like these have repeatedly taken place especially in Ladakh and Arunachal Pradesh border areas of India due mainly to differing perceptions from the two sides of their Line of Actual Control. India accepted Chinese occupation of Tibet by a 1954 trade agreement, popularly referred to as the Panchsheel Agreement, without bothering to seek a deal on its territorial border with the new sovereign neighbour.